Koodo has dropped the price of the Samsung Galaxy S2X which is great news for anyone looking for a top tier phone at a entry level price. The Galaxy S2X is Samsung’s high end phone that came prior to the Galaxy S3. It takes the S2 & makes a few tweaks, like a larger display, better processor, better sound & just all around a better version of a a great phone. 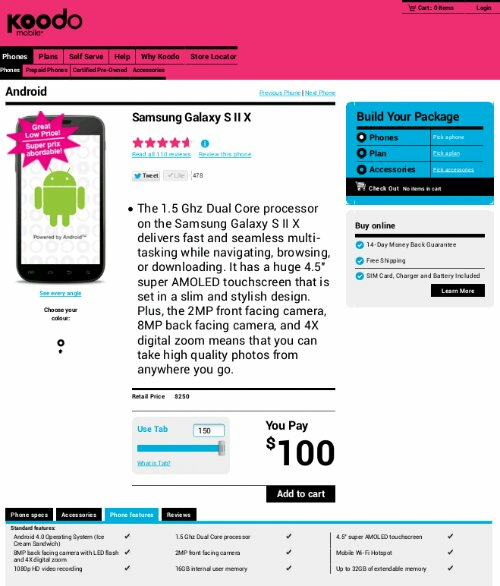 If your looking for a new phone check out Koodo’s awesome deal on the Samsung Galaxy S2X Now. If you do get it or even if you already have the S2X hit the comment section below & let us know what you think about it. What are the pros & cons of this phone?